Each year, our fantasy cyclocross contests provide a chance for readers to show their ’cross knowledge and take a temperature of how the collective cyclocross community thinks championship races are going to play out. Our latest contest was the 2019 Worlds Fantasy Cyclocross. This season, the Elite Women’s and Elite Men’s international fields each had their own unique contours. For the women, the international field had wins spread across a number of riders and heading into Worlds, there was a sense that the winner might be an unexpected one. On the men’s side, the regular season was all about Mathieu van der Poel, with the Dutch wunderkind winning every race he entered in the three months (!) before the World Championships. However, Van der Poel had entered previous Worlds races as the odds-on favorite, only to come up short, so he had a several-year monkey to get off his back in Bogense. Would the past be prologue? Was this a year for betting on the underdogs? We take a look at the numbers from our 2019 Fantasy Cyclocross Worlds contest and get to what most of you probably came here for—the winners. This season, something like 13 different women won an international race in Belgium, the Netherlands or the World Cup series. 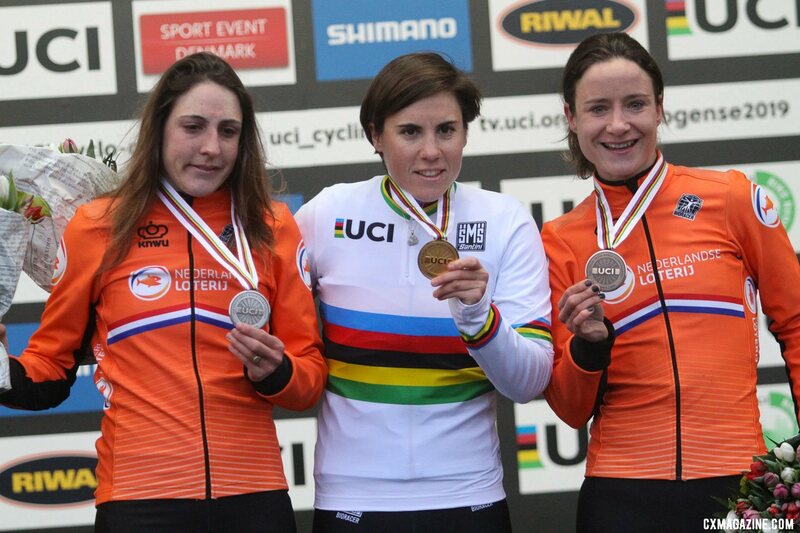 Leading the way among those winners were Sanne Cant (7), Marianne Vos (7), Lucinda Brand (6) and Denise Betsema (5). The top pick who wasn’t one of those three? Katie Compton, whom 26 people picked to one-up her second-place finish in Valkenburg last year. In total, 42 percent of entries had Compton on the podium. The most popular podium choice among contest entries turned out to be the one that actually happened. Thirty-three percent of all entries had a podium with Cant, Brand and Vos. However, only three people correctly picked the Cant – Brand – Vos finishing order, thanks mostly to so few people betting on Sanne Cant. As we have learned the last three years, bet against Cant on the biggest stage at your own risk. At U.S. Nationals, the leaders after Lap 1 were a bit more definitive than at Worlds. With big groups in both the Elite Women’s and Elite Men’s races, the primes were close ones. For the Elite Women, Worst crossed the line first. Annemarie Worst was the first across the line in Lap 1. Perhaps the most impressive performance of the weekend—well, except for those pesky athletes who turned in world-class performances—was Iowa reader Doug, who went perfect for the Elite Women’s race. He picked all seven spots correctly, had Annemarie Worst as the first across the line after Lap 1 and was just one second off the winning time gap. We will, of course, be contacting Doug for his lottery picks. 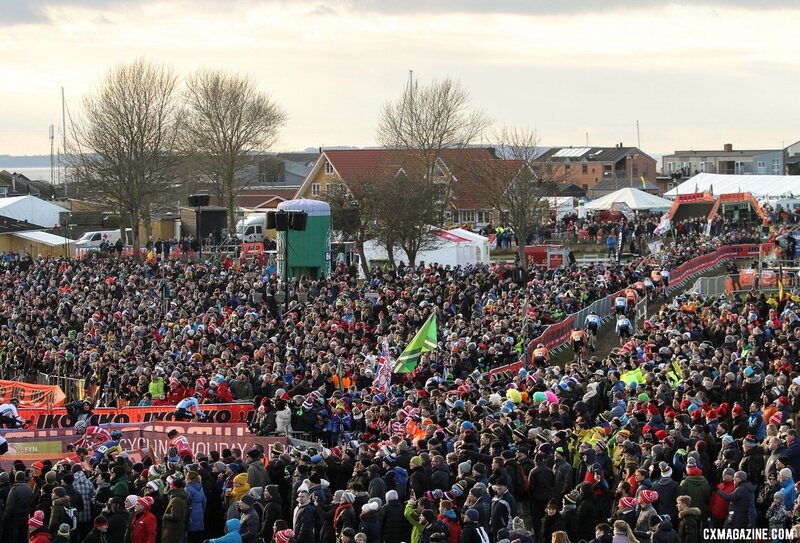 Given the dominance of Mathieu van der Poel this season, the Elite Men’s race provided an opportunity for enterprising readers to take a bit of a gamble. Last season in Valkenburg, that gamble paid off. Van Aert finished ahead of Van der Poel in 4 of 25 races before Worlds in 2017/18, giving the Belgian—at least statistically speaking—a 12-percent chance of beating the Dutchman at Worlds. Knowing most other entrants would likely pick Van der Poel last year, picking Van Aert was a high risk – high reward proposition that paid off. This season, Van Aert finished ahead of Van der Poel in 2 of 19 races, dropping his statistical odds to 10.5-percent. Not that much different than last year, but entering Worlds, Van der Poel had not not won a race since November 1. The Van Aert value bet was seemingly not as good in 2019. And that is how readers responded. Fully 85% of entries picked Van der Poel to win his second Elite World Championship. Those who did roll the dice went with Van Aert at a seven-percent clip and four percent of entries selected Aerts, even though Aerts topped Van Aert at Belgian Nationals a month ago. Even though more entries picked Van Aert versus Aerts for the win, the MvdP – Aerts – WvA podium was the choice of nearly 50 percent of all entries. 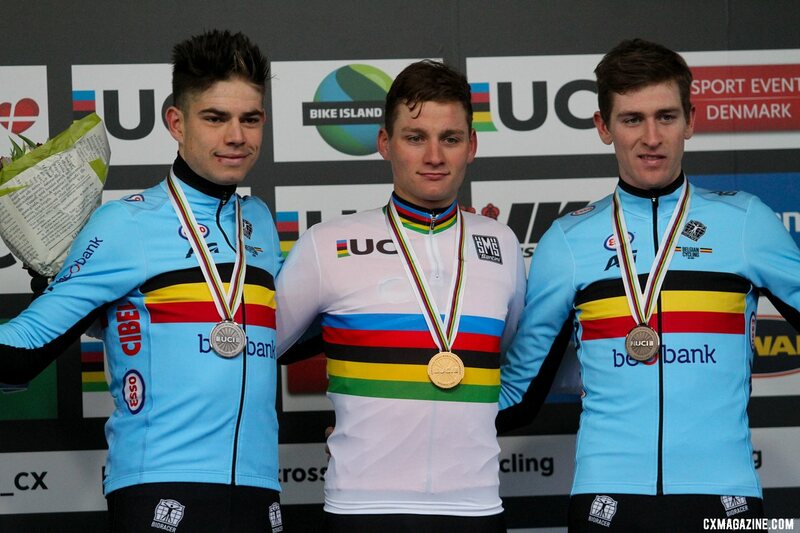 Thirty percent went with MvdP – WvA – Aerts, which was probably the most common international podium this season. Eighty-six percent of entries had a podium that included those three riders. The Lap 1 prime in the Elite Men’s race was also a close one. Lars van der Haar took the prime by maybe a knob or two on his cyclocross tire while leading a large group of riders across the line. Top Elite Men prognostication honors was a tie between Miles of Oregon and Niamh of Ireland, who each picked the top seven finishers correctly. All they were missing were the two primes. Maybe we will consult them for lottery advice as well. Thank you to our generous sponsors Easton, Feedback Sports, Dean Bikes, Merlin Bikes and Kenda Tires, our prize haul for this edition of Fantasy Worlds is impressive. Prizes go to the top nine finishers, with winners getting dibs in descending order of finish. Our 2019 winner was Mr. Perfect—at least for the Elite Women—Iowa Doug. Doug nailed the Women’s choices to the tune of 145 points (290 was the max possible score) and then rode the Van der Poel win and Van Aert and Aerts podium to the top of the standings with a total of 215 points. Kent of California came in a close second with a total of 210, thanks in large part to scoring an impressive 130 in the Elite Men’s race, and then picking Brand in second and nailing the Elite Women’s podium provided the extra points to take second. Rounding out the Fantasy Cyclocross podium with 195 points was Garrison of New Hampshire, who was one of the three people to perfectly pick the Women’s podium. We will be contacting winners soon. We had a tie for 7th through 11th place, so we went to the tiebreaker of closest to the combined time gap for the two Elite races. By popular demand, you can check your results in the table below. Thank you to everyone who entered and thanks again to our contest sponsors. Also, if you don’t already, consider giving our contest sponsors a follow on Instagram: Easton, Feedback Sports, Kenda Tires, Dean Bikes, Merlin Bikes. Rebecca Fahringer first raced cyclocross in 2013, and in 2019, she is now one of the best racers in the U.S. We profile her journey from newb to star. Italy’s T Red built its Muur titanium monster cross / gravel bike by hand with materials from Italy. Take a closer look at this versatile, wide-tire bike.